With increasing standards of living and economic development comes urbanisation. Be it in Asian nation or across the planet, the proportion of individuals living and dealing in urban areas is increasing systematically. But what this idea needs may be a correlative development of urban infrastructure. ABPL has robust capabilities during this direction and has undertaken several projects involving urban infrastructure development. With a keen understanding of the tip user and his necessities, ABPL has enforced many massive scale integrated comes meet building & townships, water system and sanitation, transport and quality systems, solid waste management and alternative equally essential parts of urban infrastructure. With a capability to undertake projects of variable size and complexness levels along side accomplished professionals to implement such comes, ABPL delivers solutions that square measure value effective and sensible at constant time. Concrete supply through ABPL affiliated company Readycon Concrete, Total production capacity 25,000.00 m3 / Month in Delhi NCR locations. Concrete, Brick and Tile works through ABPL affiliated company “ R.M.C. 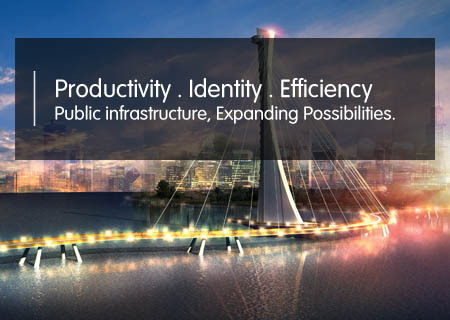 Infra Projects Pvt. Ltd. with own equipments and delivery of RMC, Flyash Bricks, Footpath Tiles of 2,00,000 units per day. ABPL owns onsite crushing and screening plants utilized for production sub base and other crushed products.